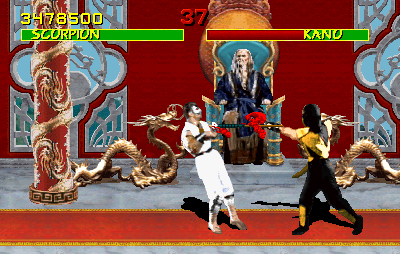 Mortal Kombat is the first installment of the long running fighting game series. It was originally released in 1992, becoming a popular arcade fixture in October of that year. Mortal Kombat introduces the ancient ritual of the Shaolin Tournament – a martial arts contest held on a secret island, accessed by invitation only. It is here the Shokan half-human dragon, Goro, has reigned undefeated as champion for five hundred years. During Goro's reign, the sorcerer Shang Tsung was allowed to corrupt the tournament in an effort to tip the balance against the forces of order. Though master of his island fortress, Shang Tsung serves the Emperor of Outworld, Shao Kahn. It is Kahn who requires ten victories in Mortal Kombat to unbalance the furies and earn unrestricted access to Earthrealm – free of interference from the Elder Gods. Shao Kahn seeks to conquer the realm, to merge it with the dark planes of Outworld. "A 2,000 year old half human dragon Goro remains undefeated for the past 500 years. He won the title of Grand Champion by defeating Kung Lao, a Shaolin fighting monk. It was during this period that the tournament fell into Shang Tsung's hands and was corrupted." 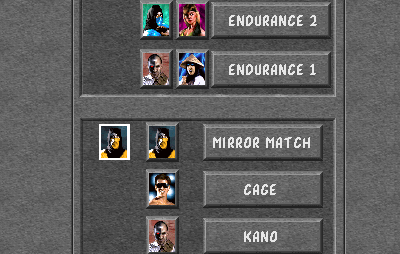 Mortal Kombat features seven playable characters: Johnny Cage, Kano, Raiden, Liu Kang, Scorpion, Sub-Zero and Sonya Blade. Unplayable characters include: Goro (Sub-Boss), Shang Tsung (Final Boss) and Reptile (Hidden). Refer to individual character pages for more information. 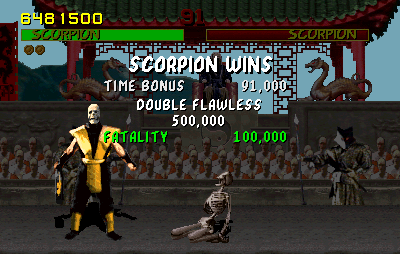 Mortal Kombat is the only game in the series to feature a points system. Attacks earn points with high scores and bonuses earned for flawless victories, fatalities and other. 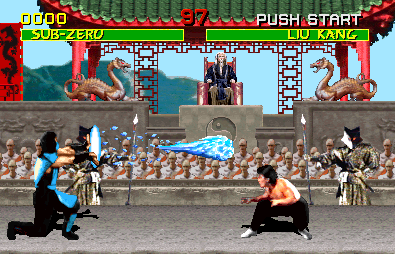 While Mortal Kombat centers primarily around a single "Battle Plan" challenge tower, it included unique deviations in playstyle that broke up the standard one-on-one fights. 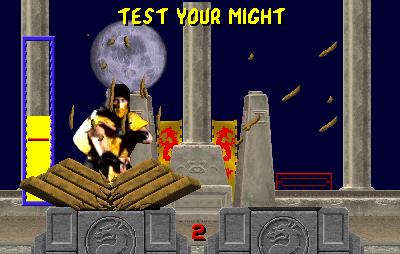 Test Your Might remains a fan favourite mini-game, challenging players to break substances of varying difficulty by mashing attack buttons intensely to charge a chop meter. There is a nine second time limit. The challenge occurs after every three victories. The mode references the popular martial arts exhibition of breaking boards, or other rigid substances. The game includes: Wood (100,000 points), Stone (200,000 points), Steel (500,000 points), Ruby (1,000,000 points) & Diamond (2,000,000 points). Mirror Match is the seventh battle in the challenge tower, which pits players against their own character. Two Endurance Mode fights precede final boss battles, forcing the player to defeat two opponents in a single fight. 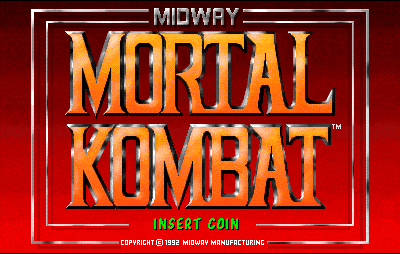 The massive success of Mortal Kombat in arcades naturally spurred ported releases to multiple platforms, including; Sega Genesis, Sega CD (May 26, 1994), Sega Game Gear, Sega Master System, Super Nintendo, Nintendo Game Boy and PC (May 25, 1994). The SNES, Genesis, Game Gear and Game Boy versions were memorably released September 13, 1993 as part of the "Mortal Monday" home version campaign. The game has received a steady string of rereleases, packaged with the Mortal Kombat: Deception Collector's Edition (2004), Mortal Kombat Plug & Play, Midway Arcade Treasures: Extended Play (2005; for PlayStation Portable), and Midway Arcade Treasures: Deluxe Edition (for PC). In 2011, Warner Brothers Interactive Entertainment released Mortal Kombat: Arcade Kollection as a three game package available via downloadable services for the PlayStation 3, Xbox 360 and PC. Ported versions for the Sega Master System and Game Gear did not include Kano in the character line-up. 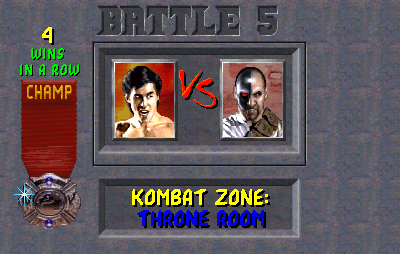 Game Boy notably lacked Johnny Cage and Reptile, but featured hidden access to Goro as a playable character. All home versions feature the "Rayden" spelling that was popularized by movies and merchandise, at the time. Ed Boon succinctly described this in a tweet as, "Decision of idiots." 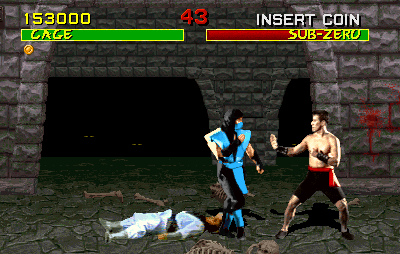 Nintendo versions of Mortal Kombat were edited to censor gore, most memorably replacing blood effects with white "sweat". SNES and Game Boy versions also contain censored fatalities. The removal of blood led to the infamous ABACABB "Blood Mode" code for the Sega Genesis. A unique text screen alluded to the existence of the code with in-fiction reference, whilst serving as the secret point of input. The word 'code' has many different definitions. The shaolin martial arts tournament is governed by a system of rules of conduct ...an ethical code. The combatants respect each other as warriors, no matter what degree of hatred they have for one another... a code of honor. Another type of code could be defined as an arbitrary system of symbols or letters for transmitting messages... a secret code. Mortal Kombat adheres to many codes, but does it contain one? Despite being the original, Mortal Kombat has often been overshadowed by its hugely successful sequel and long lasting legacy. The least elaborate of the many games, the 1992 original featured much of what would come to be known and loved as uniquely Mortal Kombat. Breaking the mold with digitized actors, the game packed all the punch of bloodletting combat, supernatural attacks and deadly finishers! The events of the first game have been recreated in Shaolin Monks (2005) and Mortal Kombat (2011), both titles an attempt to embellish the plot with greater context. The story was first elaborated upon in a special Collector's Edition comic book by series visionary and co-creator, John Tobias. A second comic book version was adapted by Malibu Comics in the mini-series Mortal Kombat: Blood & Thunder, with significant departure from established story. Perhaps the best known adaptation of the original story comes in the form of the 1995 feature film: Mortal Kombat. Directed by Paul W. Anderson, the film embellishes the relationship between lead characters, while Shang Tsung's island tournament progresses. The film borrows from mutual reference points, weaving in elements of Mortal Kombat II to better establish the supernatural threat that belies the mortal tournament. Similar material was featured in the animated short: The Journey Begins. In 1994, Mortal Kombat: The Album was released in follow-up to the 1993 single, Techno Syndrome. Featuring ten songs by The Immortals, the album combines light techno with in-game soundbytes, and references to the original game. Eight of the songs are dedicated to specific players, with Goro the only of three unplayable characters immortalized in song ("The Outworld Prince"). Techno Syndrome reached classic status with its inclusion in the 1995 film. There can be no greater legacy left by Mortal Kombat than its direct sequel. Mortal Kombat II took the series in a slightly different direction, leaving the first game to encapsulate the most pure martial arts movie and myth references. Short of being the definitive Mortal Kombat, it is undoubtedly the definitive source for the most enduring icons of the series. When fighting on The Pit stage, win your match with a Double Flawless Victory and Fatality to unlock Reptile. Note: Reptile can only be unlocked when silhouettes are flying across the moon. After you beat the game, hold diagonal up-left, select and A until the end of the credits. After they finish, the game should announce "Goro Lives" and begin the challenge tower with Goro. Note: Goro is a barebones character with only punch, throw and stomp moves. "Blood Mode" is available in all of the Sega home versions through a secret code entered on the "code of honor" text screen [see; Release Versions]. Note: You can also toggle blood on using the Cheat Menu on the Genesis [details below]. - Genesis Blood Code: A, B, A, C, A, B, B. - Master System Blood Code: 2, 1, 2, Up, Down. - Game Gear Blood Code: 2, 1, 2, Down, Up. At the main menu, input Down, Up, Left, Left, A, Right, Down. This will reveal an additional Cheat Menu that will allow toggles for various options. The screen can be used to quickly unlock Reptile by setting first stage as The Pit and selecting "PLAN BASE ONE."